Three Carnegie Mellon alumni took home Tony Awards at the 58th annual celebration in New York City's Radio City Music Hall on June 6. Eugene Lee (A'62) received a Tony for Best Scenic Design for his work in "Wicked" and the Carnegie Mellon alumni team of Peggy Eisenhauer (A'83) and Jules Fisher (A'60) earned the award for Best Lighting Design for their work in "Assassins." After the awards ceremony, Lee, who previously won a Tony Award for his design work in "Sweeney Todd," called Carnegie Mellon "a wonderful school  better than Yale where I also went." Other Tony Award nominees included Michael McElroy (A'90) for Best Featured Actor in a musical ("Big River"); Stephen Schwartz (A'68) for Best Original Score ("Wicked"); and Tonya Pinkins for Best Actress in a Musical ("Caroline or Change"). 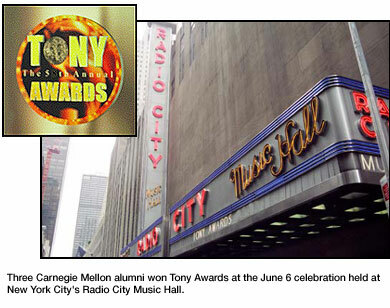 Other Carnegie Mellon alumni associated with this year's Tony Awards were presenter Rob Marshall (A'82) and performers Natalie Venetia Belcon (A'91) and Matthew Stocke (A'95). Presenter Ethan Hawke also attended Carnegie Mellon.